The Scalewatcher hard water conditioner prevents and removes lime scale without the use or treatment of salt. Scalewatcher water units are a "must have" to protect your TANKLESS WATER HEATERS, gas/electric hot water heaters, dishwashers, home water filtration units in addition to your whole home plumbing system. 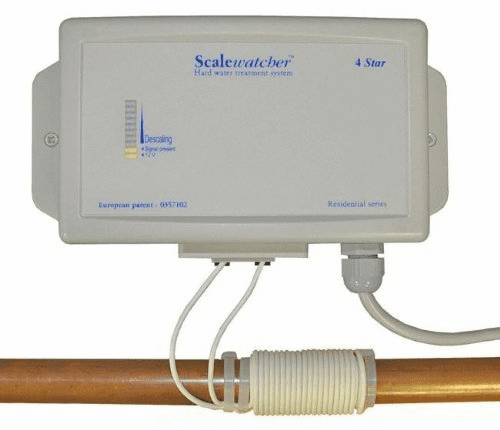 The Scalewatcher system is an eco-friendly electronic descaler that does not change the composition of the water in your home. 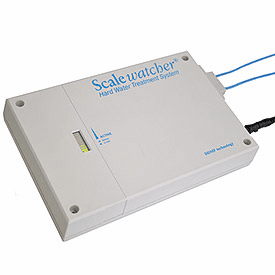 Useful in a variety of applications, including residential/commercial, swimming pools and irrigation systems, the Scalewatcher is an excellent way to address the problems associated with hard water. When water is hard, it typically has a high number of dissolved minerals that can cause scale build-up inside of your pipes, on the outside of faucets and sinks and can drastically reduce the efficiency of dishwashers and washing machines. Just �� of scale on a heating element can cause upwards of 40% more energy usage! The Scalewatcher unit consists of an electronic unit and a coil, which is wrapped around the pipe of the incoming water supply. The electronic unit works by sending out magnetic and electric fields that have a continuously changing signal. This signal agitates scale-forming calcium and magnesium in the water causing them to change shape into smaller, rounder crystals that will not easily adhere to themselves or any other surface. Additionally, because no new scale layers are being formed, old scale deposits are slowly removed by the force of the flowing water. Note: this action will temporarily increase the hardness of the water until all the scale layers have been removed. Because this is an electronic water conditioner, it is important to remember that a water hardness test will give similar results before and after using Scalewatcher because it measures mineral content. Scalewatcher does not remove minerals, but rather places them in suspension, which prevents limescale. 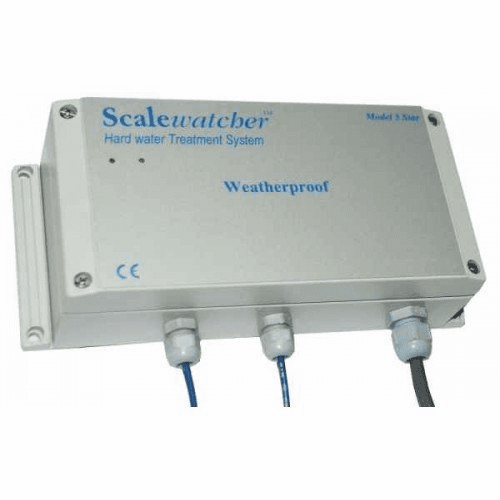 The benefits of the Scalewater system are many. Compact and portable, the Scalewatcher is easy to install and maintenance free. It is compatible with all types of pipes, including copper, steel, PVC and lead; all you need is at least 4� of straight pipe in order to properly install the unit. 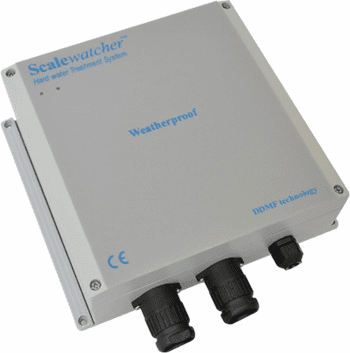 The Scalewatcher can be used in homes with municipal water systems and even well water. Not only will one Scalewatcher descale and protect your whole home, but it will prevent new scale from forming on everything from sinks and bathtubs to hot water systems and appliances, extending their life and improving their efficiency. Unsightly existing scale found on faucets and showerheads is softened over time with the use of a Scalewatcher making it easier to remove. The Scalewatcher unit uses very little energy and costs less than $14 per year! Unlike other water softening systems that use salt or other chemicals, the Scalewatcher is environmentally friendly as it does not use any of those things, making it gentler for your skin. The Scalewatcher 3/4/5 Star is guaranteed to prevent or considerably reduce the accumulation of scale and to remove already existing scale during the first 30-90 days of installation. If you are not completely satisfied with the results of the Scalewatcher, email our company, A.M.I. Services, within 12 months* from delivery to obtain a Return Merchandise Authorization (RMA). Once the unit has been returned and determined to be undamaged, a full refund of the purchase price will be issued. In order to be eligible for the money back guarantee, you must have continuously operated the Scalewatcher unit for at least 6 months. If you believe the unit is not operating correctly, please contact our company, A.M.I. Services, before disconnecting the system. We may be able to advice on alternative methods of installation. Should we be unable to assist in resolving the problem, then you will be offered a refund of the unit price only on return of the unit in good condition. Failure to follow the procedure outlined in our warranty may result in the assessment of a 15% re stocking fee. *The Scalewatcher Nano only has a 6 month money back guarantee and continuous operation is required for a period of 3 months in order to be eligible for this guarantee. The Scalewater 3/4/5 Star is warranted to be free of defects in material and workmanship for a period of 10 years** following the date of delivery. In the unlikely event your unit becomes unserviceable, it will be at the discretion of Scalewatcher North America Inc. as to whether your Scalewatcher will be repaired or replaced. To make a claim under this Limited Warranty, you must first obtain a Return Merchandise Authorization (RMA) from our company, A.M.I. Services. 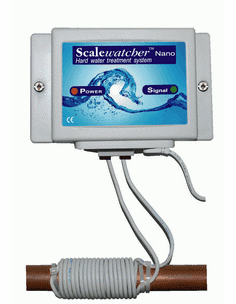 **The manufacturer's limited warranty for the Scalewatcher Nano is 2 years.